I have come to change the plugs on my daugthers lupo 1.0, but do'nt know the plug gap, could anyone help! Hi i know this is a really old post BUT CANT FIND ANYTHING ANYWHERE ON PLUG GAP. 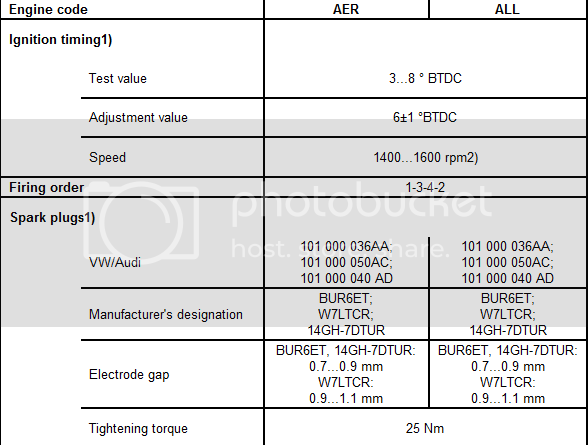 2003 VW Lupo 1.0L petrol engine code AUC. just need to know gap as dont trust them all being pre gapped, have asked everywhere with nothing. @mk2ever hammered a spark plug ? I did on an old Peugeot, god knows what the gap was when I was done. Yeah, just give it a tap, but dont go mad or the earth electrode falls off into the engine.... no one wants a bit of metal bouncing around in a cylinder. Do a test and see how big a gap the spark can jump- about 30mm on a dry day (screwdriver to block). But the compressed fuel air mix does block the spark to an extent, so i generally max out at 2mm even with a high compression engine.